Our next stop was Plettenburg Bay which is about 250 km south of East London and a popular spot with both South Africans and tourists as a resort destination. We stayed at the lovely Emily Moon Resort overlooking the banks of the Bitou River which discharges into the bay – a great spot for birding and the resort provides canoes so you can paddle around the estuary looking for birds. 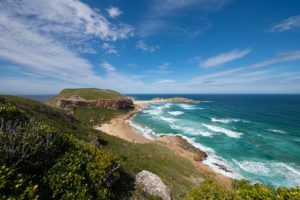 Dort and I spent the day hiking around the Robberg Nature Reserve which is approximately a 10 km loop – it is a rocky peninsula that sticks out into the bay and affords beautiful vistas up and down the coast. Lots of wild flowers were in bloom and whales were migrating off the coast (mainly Humpbacks) – large colonies of Cape Fur Seals (apparently Great Whites cruise off-shore, but we couldn’t see them despite the clear water). A truly beautiful part of the world…a few photos of our day’s walk can be seen by clicking this link on the embedded photos.